The Scintex vehicle mounted fogger can be positioned on vehicles such as utilities, trucks, trailers, quad bikes and ATVs to name a few. This provides a mobile fogging unit capable of large fog and chemical output. As the unit is transported mechanically a large chemical tank can be used providing a long duration of operation. The unit is a dual thermal and ULV cold fogger meaning it is compatible with a larger range of chemicals with more modes of operation. 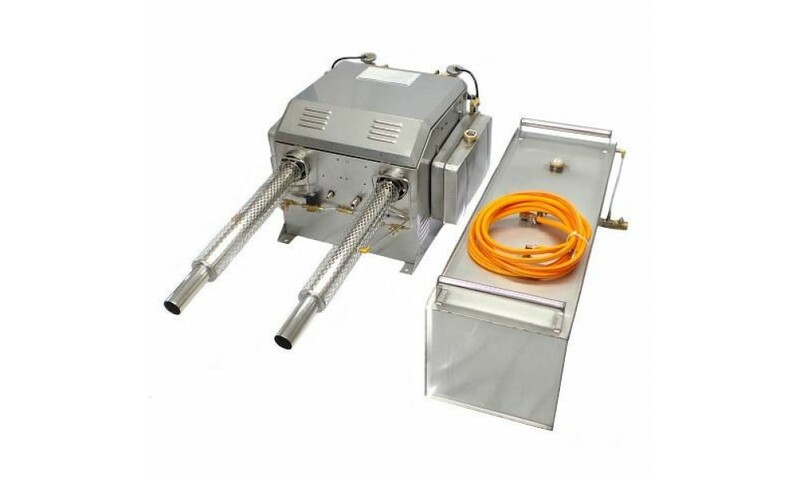 This fogger can be configured for ULV cold fogging or thermal fogging by simply changing some valves and swapping your fogging solution. Thermal fogging uses a hydrocarbon as the carrier solution and generates a thick white smoke type of fog which people generally associate with mosquito fogging. Carrier solutions can range from the most cost effective being diesel to low odor deodorised paraffin oils to pre-mixed proprietary fogging solutions. The active chemical used can also be varied and as long as they are labelled as suitable for thermal fogging they will be suitable for this machine. ULV cold fogging uses water as the carrier solution to produce extremely small droplet mist which carries and hangs well to maximise contact time with flying pests. The advantages to ULV cold fogging include low/no odor as water is the carrier not hydrocarbon, low/no visual pollution (again only water mist is observed) and low/no active chemical destruction as the solution remains cool and is not exposed to high temperatures as in thermal fogging.